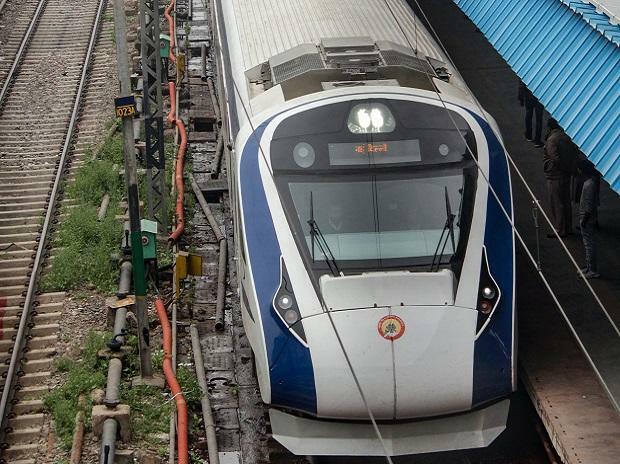 The Vande Bharat Express, India's first semi high-speed train, was delayed by more than an hour each way during its first commercial run, officials said on Monday, attributing the delay to "dense fog". While travelling from Delhi to Varanasi on Sunday, the train, which was flagged off by Prime Minister Narendra Modi on February 15, was delayed by 1.25 hours. On its return journey, it was delayed by 1.48 hours, officials said. "The train was late because of dense fog in the Ghaziabad-Tundla section. Due to this, to maintain security of passengers and safety, the train was run at a speed of 60kmph. This is normal during this time of the year. It was environmental conditions that delayed the train," said Northern Railway spokesperson Deepak Kumar. After the fog dissipated, the train, which doesn't have a locomotive, ran at an average speed of 130kmph, officials said. Due to foggy conditions, the train reached Varanasi Cantonment station at 3.25 pm instead of its scheduled arrival at 2 pm on Sunday. It left for New Delhi at 4.25 pm on its return commercial journey. The delay took place a day after the train broke down on its way back to the capital from Varanasi following its inaugural non-commercial journey. In a detailed press release on Saturday night, railways said during the transportation back from Varanasi it was stopped at Chamraula station of National Capital Region, about 18 km after crossing Tundla station. "There was an issue of communication between the last basic unit of 4 coaches and the rest of the train probably due to some external hit. Thereafter, safety features in the train applied brakes. The train was checked for faults and moved to Delhi," it said.